Beautiful fall is here, and it's festival season again! We already kicked it off with Earth Harmony at Avalon Gardens on October 1st and 2nd. Green Heart is at Sunday Heirloom farmers market at Rillito Park every Sunday, now winter hours, 9 am - 1 pm, UNLESS WE ARE AT A FESTIVAL. Follow us on Facebook for a reminder on Friday morning, as we always post our destination for the weekend then. Rillito Park is at 4502 N. 1st, where the racetrack is, on the north side of Rillito Wash. Enter on 1st, and drive into parking area until you can see the canopies and the 3 pavilions; we are in Pavilion 1. 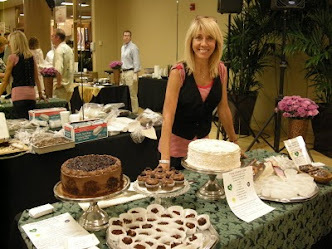 We are making so many special order cakes that we are NOT planning to return to St. Phillips Saturday farmers market. So - think of Green Heart for birthday, wedding, or other cake occasions! Green Heart will be at the U of A Mall farmers market as often as possible this fall (we've already done 3 markets there so far). Again, we post on Facebook on Tuesday morning, the day before a Wednesday market at U of A. Be sure to follow us to get these reminders! Sunday October 16, 11 - 4: Envision Tuscon Sustainable Festival at the YWCA, 525 N. Bonita. Our 4th year; a full selection of sandwiches, baked goods, salads, hot soup. Really fun in a great, intimate setting - and it's free! Wednesday October 19, 10 - 2: U of A Mall farmers market. On the lawn in front of the Student Union - come have lunch or a healthy treat if you're at the U of A.
Saturday and Sunday November 5/6: Chris Bubany Harlow Gardens Holiday Fair. Great artwork in a beautiful garden setting, conveniently located on Pima Street. Saturday November 12: Sahuarita Pecan Festival. Our second year, we bring healthy plant-based food to this big and wonderful festival by the pecan orchards in Sahuarita. Sunday November 13 AND 20: Heirloom Farmers Market, 9 - 1. So in April, my husband and I had our wedding reception here and we both have no regrets with choosing this venue. I am still receiving compliments from all our guests. The food at wedding venues NYC was delicious from appetizer to dessert.